Brett Favre a Viking? For one Wisconsin t-shirt store, it’s all good. Isaac Lenz is store manager at Sconnie Nation in Madison, home of the ‘We’ll Never Forget You, Brent’ t-shirt. “The day has finally come, they’re flying off the shelves now, we’re selling more today than any single day previous to this,” says Lenz. 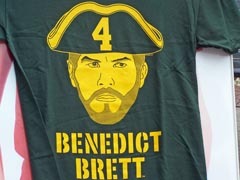 Still, Lenz wishes Favre good luck this year: the better he does, the more shirts Sconnie Nation will sell.